The Budd Car ride from White River or Sudbury to the Lochalsh flag stop is vibrantly scenic and will last a lifetime in your memory as a unique experience on top of fishing Wabatongushi Lake. The rail line cuts through rock faces, swamps, and lush boreal forest, displaying the best of northern Ontario’s landscape. As the train approaches Lochalsh from Sudbury, passengers will ride over the open swampy headwaters of the Trout Stream (also known as Coddam’s Creek). We spotted a moose grazing in the reeds just moments before this photograph was taken, and watched brook trout swim downstream in the crystal waters. The Trout Stream meanders through the wilderness and empties out into Wabatongushi Lake in a beautiful waterfall, as we’ve showed in past photographs. You can paddle up the stream in a canoe, catching trout along the way. The next water body that the train passes over is Sucker Creek, which is also accessed from Wabatongushi Lake. Just drive one of our cedar strips right into the bay by its rapids and enjoy great pike fishing! A moment later, the train will slow down at the Lochalsh flag stop, where we’ll be waiting to ferry you to Camp Lochalsh or Loch Island Lodge. 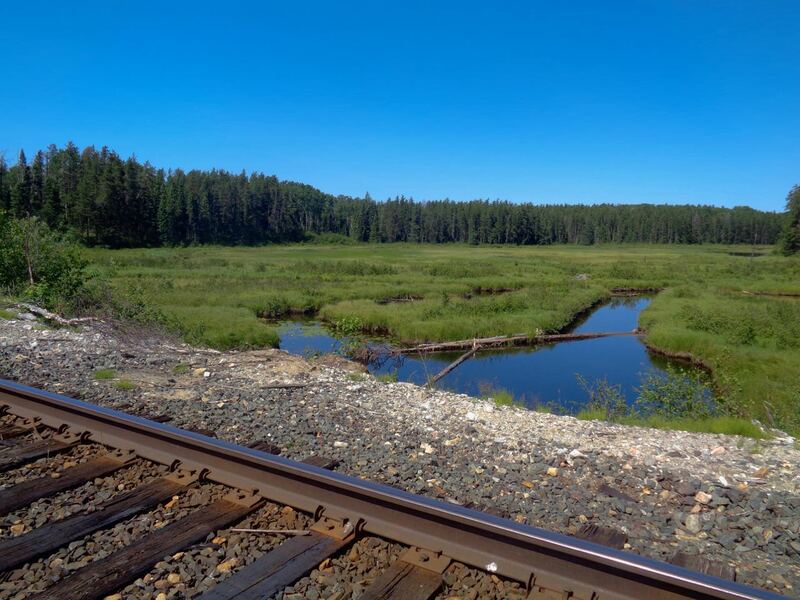 Guests travelling from White River to Lochalsh won’t have the chance to see the Trout Stream by train, but will stop in historic fur trading and gold mining towns such as Missanabie. There are amazing sights around Wabatongushi Lake whether you choose to arrive by train or not, but boarding the Budd Car will be the start of a fishing trip unlike any other! Next Post Next Post: Happy Thanksgiving from all of us at Loch Island Lodge / Camp Lochalsh!